I remember when I was first introduced to acroyoga. 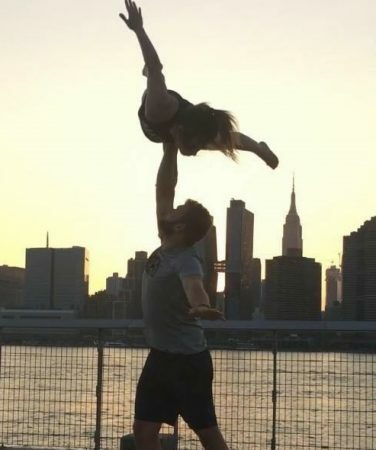 It was on a photo I saw on instagram, a beautiful photograph of two partners in high croc pose. I was blown away by the beauty of it, the shape, the strength and control of two people, the art they created with their bodies and the beautiful scenery in the background. I wished it was me in the photo. However, I could never do that. I was too old and my time had passed. I admired from afar. I followed Instagram and Facebook acroyoga groups, happy that others were enjoying this beautiful sport even if I could not. One day a studio in New York offered an introductory class. I decided to try it out. It was a beginner class where we started with a simple L based bird pose. I can’t explain the feeling of my first time in the air. It felt like I was home, like I found the cloak of happiness. I fell in love. I joined classes assuming the love affair would diminish eventually, but every time that feeling of home kept bursting in my heart. The feeling is there every time I practice. 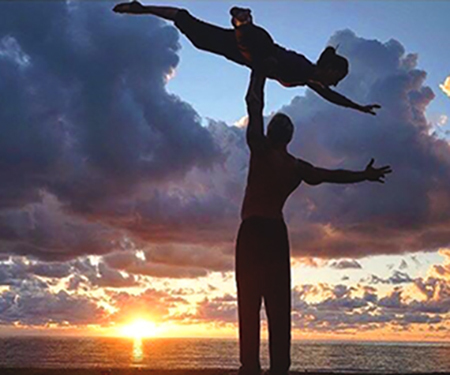 The benefits of acro are endless; building core strength, muscles tone, flexibility, stretching. But it’s been so much more than that. Acroyoga has changed my life more than I could have ever have known, and in ways I couldn’t have ever imagined. For someone who suffers from social anxiety this component has changed my life. Acroyoga at minimum requires three people; the base, flyer and spotter. We are working together as a team. If a skill isn’t materializing, we work together and problem solve. A fellow might join our team to make suggestions and help us out. We communicate and assist each other; we cheer each other on and are proud of their progress and success. It is beautiful to experience your growth and develops along with others. It’s a “we” sport, we don’t do this alone. We are fostering friendships and community, we encourage and we are encouraged. So when a skill is mastered I high five my copartner, our spotter and the photographer, thanking them. I’m well aware that it was all of us who contributed to the success. I’ve learned that gifts you give away are gifts you receive back. If you show others respect you receive respect back. You look at everyone as equal and important, you’ll respect them, and you’ll want them to feel secure and safe. At Interfusion Festival I learned an important lesson that has stayed with me. At the cuddle party we start with numerous exercises about respect and consent. In one of the exercises we were told to ask another person if we could give them a kiss, they were instructed to answer no. When discussing the exercise we discussed how some said “not now”, “maybe later”, “I’m sorry”. We were trying to soften the rejection or excuse ourselves for how we felt. She told us to “respect our no”. Don’t apologize; be confident to say no to something we don’t feel ok with. I think about this a lot. Why should we feel the need to apologize when someone asks us to do something we aren’t comfortable with? Acro teaches us to respect each other’s space and feelings. There are many opportunities to respect each other’s no. We appreciate the honesty people share with us when they tell us they don’t feel safe with something; we also respect ourselves not to compromise in any way. When practicing I’ll ask “do you feel comfortable with this?” “Are you ok if I touch you?” This allows someone to feel at ease when saying no. It helps build a community of tolerance and trust. It makes me feel okay to say no. I’m also learning to respect my personal boundaries. In acroyoga the focus of consent is constantly practiced. Acroyoga is a practice where we allow others in our personal space. My teachers remind us to ask our partners if it’s ok that we touch them and join them in their practice. We focus on touch that feels safe. Safe touch helps us feel special and builds closeness. That lesson follows our lives, in all situations we learn to make others feel safe. We are sensitive to others feelings and want any touch with others to build closeness: it might be a handshake with a colleague, giving a friend a hug or closeness we experience with a lover. Acroyoga teaches us that touch should bring healing and love to each other. Safety and consent go hand in hand. Safety is taught alongside with every skill, we learn how to keep someone from getting injured. It sends a special message .The message is that you are important, I want you around and I’m taking it upon myself to keep you safe. When we care for others we help ourselves as well. This is another way acroyoga builds loving and strong friendships between one and other. In life we are busy often running from one place to another. We have many commitments and often juggle many responsibilities. It’s a stressful way to live. Acroyoga is something I do because I love it, when I’m practicing I’m happy. I’m taking time for myself amid my bustling life of work, children, appointments, commitments and many other responsibilities. It’s a way I get to love myself and acknowledge that taking time to recharge is important. I always leave an acroyoga practice a happier, more sane person, a better mother, and able to tackle things more efficiently. Learning to pause and breath is also something we forget to do. Did you ever take a deep breath and realize you haven’t even slowed down to breath all day? In acro being rushed will hinder your progress. I’m constantly reminded to slow down and breathe. Even one deep breath has positive benefits and slowing down reminds us to enjoy life. I make a point of recognizing my blessings daily. Acroyoga is always on my list. During a session I find the blissful feeling of gratitude exploding in my head so intensely that I joyfully exclaim, “I love this day, I love everyone here, I love everything”. Feeling gratitude makes my life beautiful: when I’m in a challenging situation I try look for the good. I try to view others in a positive light. When you see a Mom on a cell phone in the park you can either notice that she’s not interacting with her children, or what a great mom she is to allow her children to run and play. You can resent your partner for leaving a mess or you can feel grateful for the times they’ve take out the garbage. In acro the good is highlighted verses the challenges. I’ve learned to use that tool in life. I was stuck in traffic, running late and frustrated. I was aggravated. I asked myself what part of this am I grateful for. Could there be good in running late and not feeling serene? Yes. I was grateful for the opportunity to work on my patience. I was grateful to practice acceptance of things beyond my control. I asked myself what could make this situation better. I had time to listen to music and I had time to reflect on the many gifts I have in my life. I arrived late but calm and grateful. Acroyoga teaches me this tool daily. When I’m struggling with anything I stop and ask myself what part of this am I grateful for? The word failure is often viewed as a negative word; lack of success, incapable, not qualified. The truth is that failure provides a platform of such incredible achievement, I welcome it. That croc pose I saw, that first drew me to acroyoga, I tried, I failed, I tried again, I failed, I gave up. Croc wasn’t going to be part of my practice. So many of the lessons I learned from acroyoga changed all that. Encouragement of others. They told me I could do it, they encouraged me to try. Hard work brings achievement. The encouragement led me to try over and over. Getting rid of the negativity. I ignored the instructor that didn’t encourage me. How I now see failure; failure builds my development more than effortless success. The delight of accomplishment is magnified by the amount I’ve failed. Failure gives me courage; how many of us don’t want to try new things because of fear of failure? Failure encourages determination. I can give up and tell myself I can’t do this, but instead I choose perseverance. Failure isn’t comfortable, but fighting that feeling will empower you with all of life’s challenges. Every success that was preceded by failure is one of life’s best educators. I now see failure as character building experiences. The word failure is a beautiful word. That croc I almost gave up on- I’ve got it, it’s amazing, I’m proud of myself. I’m working on hand to hand now. I must have practiced it hundreds of times. I see small progress and I’m going to nail it. It used to be my high bar, what only the best do. Oh no, failure showed me there’s no end to what I might achieve. Acroyoga has changed my life. I’ve made new friends, and I’ve found a supportive community. I’ve learned to respect myself and others. I’ve learned that growth is possible and that there is more growth to come. There are benefits I’m not even aware of. I’ve learned to slow down and enjoy life. Acro continues to make me feel grateful and lucky every day. And that strong core and increased flexibility, and fun instagram pictures, I’ll admit I love that too. Interfusion Festival was a weekend packed with all these wonderful things. The love, caring, learning to breathe, building community are just a small part of what you’ll experience. My experience there has changed my life and I still go back to those special experiences and moments all the time. I’m excited to be volunteering in the acro studio at Interfusion and to be part of the sharing the love. Join us at Interfusion Festival, you will experience the magic.